This gloves brings the web-slinging magic of our favourite hero to life! A sling of the wrist like Spider-man results in amazing web battling sounds. Batteries included…. 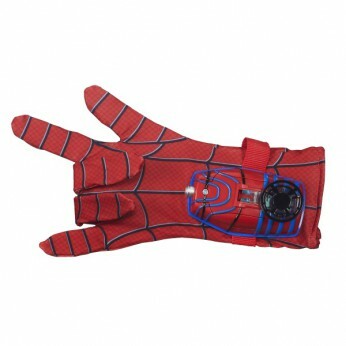 Feel like Spider-Man when you put on this fun, electronic glove and with the flick of the wrist, activate the cool web-shooting sound effects. Feel like Spider-Man when you put on this fun, electronic glove and with the flick of the wrist, activate the cool web-shooting sound effects. Batteries required: 3 x button cell (included). For ages 4 years and over; EAN: 5010994735227. WARNING(S): Not suitable for children under 3 years old. This toy costs approximately £12.99 (for the latest and best prices make sure you check our retailer list for the Spiderman Hero FX Glove above). In our review of Spiderman Hero FX Glove we classed it as being suitable for ages 4 years, 5 years, 6 years, 7 years, 8 years but recommend you check the manufacturer specific advice before purchasing.